Man 1: Hey, Dave, you going to the game today? Dave: I don’t see that happening. We have so much wood to measure. You know how long that can take. Man 1: Not today. I’ve got a secret weapon. Man 1: I’ve got the Wagner MMC 220, the fastest meter out there. Man 1: A lot faster. Fast enough to blow that pin meter out of the water. Man 1: Oh, really. You want to put a little something on that? Dave: Absolutely. What do I get when I win? Man 1: Loser pays for pizza. Man 1: All right. Measure this wood every 12 inches. Ready? Dave: How’d you do that? Man 1: Wagner’s IntelliSense Technology reads in the wood with no holes. No upside down readings. So fast it looks like it got me free pizza. Oh, and by the way, I like anchovies. Man 1: Bye. Don’t be late. 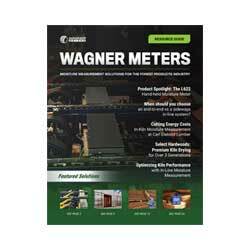 To learn more about Wagner Meters, visit www.WagnerMeters.com. Pizza not included.